Caption slip reads: "Photographer: Glickman. Date: 1951-09-19. Assignment: Valley stickup. 4000 taken bowling alley. 12229 Ventura Boulevard, Studio City. 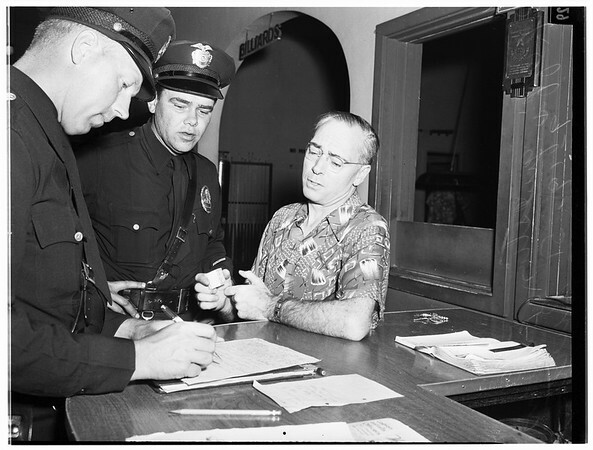 Mug shots of Roy Nixt (white shirt) and Edward Collins (dark shirt). Miss Fay Neuss tells about robbery. Detective Pat Poe checks over office where Nixt held eight at shotgun point. Police officers question Elwin Burton, owner of bowling alley that was heldup".